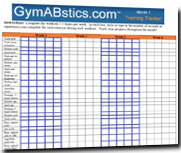 GymABstics is a full-body fitness program that is based upon the sport of gymnastics. Former elite gymnasts Andy and Jay Thornton will guide you through the unique and powerful exercises that gymnasts use to develop the upper body, lower body, and in particular the abs – all without the need of any weights or equipment. Complete with flexibility, nutritional guidance, and three-minute “six-pack workouts,” GymABstics is one of the most innovative and comprehensive programs in the world. Begin your quest to develop the body of a gymnast today! GymABstics 1, Building a Foundation will guide you through a unique, well-balanced workout that will introduce you to the basic body positions in gymnastics. Jay and Andy teach you the essential “hollow” and “arch” positions that provide the foundation for a gymnast’s rock-solid core, and reveal some great exercises gymnasts use to trim their love handles and firm up their gluteals. Some light strengthening of your chest, biceps, triceps, quads, and calves round out this fun full-body workout routine. In month 1 of the GymABstics Program – Building a Foundation – you can expect that your friends and family will begin to notice a change in your general level of motivation. They’ll start to notice that you just seem more driven than normal, and that you seem to approach each day with a sense of optimism and purpose. As you start to see the importance of setting aside a little time for GymABstics, you’ll start to find ways to become more efficient in virtually everything you do. Of course others might even get a glimpse of your GymABstics workouts, and they’ll probably be intrigued by the unique exercises you’re doing…in fact they’ll probably want to jump in and try some of them with you. More importantly, they’ll immediately sense your excitement and enthusiasm for the brand new program that you’ve become a part of. They’ll also start to notice some changes in the way you eat – from the choices you make at the grocery store, to the foods you choose to “snack” on, to the items you order when out at your favorite restaurant. You’ll be instantly armed with some invaluable knowledge about fats this first month, and it’s going to have an immediate impact on the nutrition choices you make. We encourage you during this first month to share your excitement for GymABstics will all your friends and family – invite them to be a part of it with you! GymABstics 2, Body Booster, is a high-energy workout designed to really rev up your engine while adding strength and tone to all areas of your body. Filled with innovative exercises for your upper body, lower body, and core, this fast-paced routine will utilize many muscle groups simultaneously and combine many exercises back-to-back. Body Booster will jumpstart your metabolism and boost your overall energy levels by helping you burn a tremendous number of calories. In Month 2 of the GymABstics Program – “Body Booster” – others will start to take notice of your increased energy level. After already building a strong physical foundation and making some incredibly important changes in your nutrition, your body will now have begun to adjust to your more active and efficient lifestyle. During this month, you’re going to be doing some workouts that will really boost your metabolism. They’ll be fun, fast-paced, and designed to use many of the basic positions and exercises you learned in month 1 to really rev up your engine and help you burn some serious calories. You’ll be sleeping better than ever before, and with this month’s nutrition topic, you’ll really start to see the importance of eating frequent healthy meals and snacks throughout the day. Along with your newly boosted energy level and metabolism, others will notice a significant elevation in your mood as well. GymABstics 3, Fat Burning is a cardio-intensive workout designed to really slim up your waistline and trim those excess pounds you’ve been carrying. This workout will focus most heavily on your midsection and will incorporate upper abs, lower abs, obliques, and hip flexors – all with the aim of giving you the lean, slender physique we all yearn for. Fat Burning will also mix in some endurance exercises for your upper body and lower body, so get ready to sweat and watch the pounds and inches melt away! In Month 3 of the GymABstics program – “Fat-Burning” – others will start to notice that you’ve lost weight. With this month’s focus on more intense cardio as well as more advanced core exercises that will really start to trim up your midsection, you’re going to start getting comments on how thin and fit you look. Your slender waistline will draw stares of admiration, and expect that you might be tightening your belt a notch or two tighter than you used to. You’re also going to be learning about the role that carbohydrates play in sustaining your energy level for endurance-type training, and you’ll begin making some healthier choices with regards to sugars and “sweeteners” that seem to be all over the place nowadays. Don’t be surprised if your friends and family start to ask you a lot of nutrition and exercise advice, as they’re going to be impressed with the weight that you’ve lost and fascinated by your new slim and lean physique. GymABstics 4, Strength and Power is particularly aimed at toning up your biceps, triceps, pecs, quads, and calves using lots of challenging strength exercises that only gymnasts do. By combining unique exercises like the planche, maltese, and L-sit with plenty of innovative exercises for your abs and lower back, Strength and Power will give you a well-balanced physique that’s molded and sculpted like a gymnast. In Month 4 of the GymABstics program – “Strength and Power” – others will start to notice some impressive strengthening in your biceps, triceps, pecs, quads, and calfs. That’s because we’re going to be taking the newly trimmed up body you’ve developed over the first three months and adding some power to it. Our goal is not to get “bulky,” but rather to develop a well-balanced, extremely physically fit body that’s healthy, lean, and strong. We’re still going to be doing plenty of innovative core exercises that will continue to develop our abs, sides, lower back, and gluts, but we’re going to be spending a little more time molding our musculature now. Don’t be surprised if we start to add just a couple of pounds back to our reduced body weight from Month 3…but don’t worry, it’s going to be all muscle. You’ll also be learning about proteins and what foods in particular you can be eating that will provide you with this essential nutrient in the healthiest way possible. GymABstics 5, The Sculpting Stage is an exciting and rewarding workout that will focus on slow, concentrated exercises designed to really carve out the musculature in all areas of your body. With less of an emphasis on cardio and more of an emphasis on specific muscle definition, this workout consists of two segments – one that introduces some very challenging and integrative exercises for your abs, sides, lower back, and gluteals, and another that targets your upper body and legs. In Month 5 of the GymABstics Program – “The Sculpting Stage” – you’re going to be turning some heads now and your confidence and body image are going to be at an all-time high. You’re going to be doing some intense core training that’s going to carve out the muscles in your abs, sides, lower back, hip flexors, and glutes like you never dreamed possible. We’ll still be doing some great exercises for the rest of your body, but one of our top priorities for this month is to really sculpt that “six-pack” you’ve been wanting for so long. You will have already seen some incredible results in your midsection over the last four months, but now we’re going to really flaunt it! Your body is going to look and feel better than it ever has, and you’re going to be getting more compliments on your physique than ever before. You’re also going to be learning about the power of fruits and vegetables, and will be enjoying some great fruit-based recipes with peaches, strawberries, bananas, oranges and blueberries. GymABstics 6, The Synthesis is a fast-paced, envigorating workout that uniquely integrates all of the best exercises from our other five workouts and introduces new exercises for all areas of your body as well. Believe it or not, this incredibly efficient and comprehensive workout packs in about seventy exercises into just thirty-five minutes. It’s a fun and fascinating blend of abs, sides, lower back, gluteals, chest, arms, and legs – cleverly combined into one innovative workout routine. In Month 6 – “The Synthesis” – you’re going to be taking all of the fitness principles you’ve gained over the last 5 months and combining them into some incredible full-body workouts. With an equal emphasis on all areas of our body, we’ll be fine-tuning our physique as if it were a brand new car. We’re going to try and turn our six-pack into an eight-pack, and truly define those muscles that we want to accentuate the most, such as our gluteals, our biceps, triceps, and our calfs. You’ll also begin applying some valuable principles with regards to two of the most consumed substances in American diets today – alcohol and caffeine. This is the month where others will begin to admire all the details of your newly sculpted body, and you can expect to become viewed by others as virtually an expert on physical fitness and nutrition. You’ll be drawing respect and attention like never before, and the consensus among your friends and family will be that this program has changed your life. You will have gained six months’ worth of invaluable health knowledge, and as you look back on your phenomenal progress over the last six months, you’ll realize that GymABstics has provided you with the most powerful fitness and nutrition secrets in the entire world. Your confidence, your overall health, your body, and your entire outlook on life will be completely transformed, and you’ll be using the exercises and principles you’ve learned from GymABstics for the rest of your life. Download the GymABstics Workout Circuit MP3 audio and listen to it on your iPod while you workout. Record your workouts each week and watch your own progress! Words of encouragement, ways to modify your workouts, and a new “Box of Secrets” after each workout …straight from the creators! Great healthy ideas for breakfast, lunch, dinner, desserts, and snacks! What Makes GymABstics So Effective? You don’t need a gym membership or any fancy equipment – not even dumbbells or a chin-up bar. All you need is your own body and a little bit of space! GymABstics is designed to be a motivational, inspirational, comprehensive health and fitness program that will sculpt your body while revitalizing your life. Experience a transformation in your attitude, self-esteem, state of mind, quality of sleep, motivation, and outlook on life – all while achieving the body of your dreams.